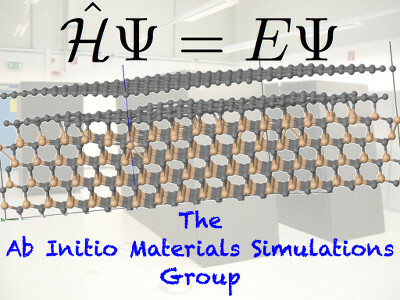 Welcome to Ab Initio Materials Simulations (AIMS) at Duke! Dr. Volker Blum, Associate Professor, Department of Mechanical Engineering and Materials Science. Our focus is to predict the properties of real materials - known ones and those that are not yet known - using computers and the basic mathematical "first principles" that govern the world around us: the laws of quantum mechanics and "multiscale models" based on it. We create the infrastructure to do so, and we work on specific high-value materials problems - either on our own, or with other groups (theory and experiment) around the world. The picture shows the short version of Schrödinger's Equation, and a cartoon of a graphene film grown on an SiC substrate, which we addressed in Physical Review Letters 111, 065502 (2013), Physical Review Letters 114, 106804 (2015), and in ACS Nano (2016), doi:10.1021/acsnano.6b02402. Our current areas of focus include work on new semiconductor materials for energy related applications, e.g., for photovoltaics or light emission, together with the group of David Mitzi and further collaborators both inside and outside North Carolina's Research Triangle region. We're especially proud of leading an NSF-DMREF funded collaborative team "HybriD3" on hybrid organic-inorganic semiconductors, with luminescence as a target area, and of being part of a new DoE-funded Energy Frontier Research Center CHOISE, which focuses on the broader underlying science and promise of tailored crystalline organic-inorganic semiconductors. In the realm of inorganic semiconductors, NSF-funded research has recently led to identifying a promising new class of multinary semiconductor materials I2-II-IV-VI4 with great promise for thin-film photovoltaics and other "light-harvesting" applications for renewable energy generation. In addition to work on inorganic materials, the group also has a significant investment in molecular structure and spectroscopy, most recently focused on molecules for magnetic resonance with sensitivities enhanced by hyperpolarization, together with the group of Thomas Theis, now at North Carolina State University. The group's work is based on the internationally used and developed "FHI-aims" code for molecular and materials simulations, of which Volker Blum is coordinator and lead developer. This is an accurate, all-electron electronic structure code that scales efficiently to system sizes up to thousands of atoms, and to computers with (ten)thousands of CPU cores. A cornerstone of our methodological work is the NSF SI2-SSI funded software infrastructure project "ELSI" developed jointly with collaborators around the world to facilitate simple, efficient, and well documented connections of community-based electronic structure codes to massively parallel, high-performance solver libraries for density functional theory. Much of our long-term vision is summarized in Volker's New Faculty Lecture, available on Duke's Youtube channel by following the link. If you are interested in undergraduate, graduate or post-doctoral research experience in an exciting field embedded within an international community of colleagues, contact us. If you are excited about computational science applied to materials research and if you are comfortable with computational methods and tools, we would love to hear from you!